The overflowing amount of competition on the modern market results in superb quality being made more and more accessible at unbelievable price points. This masterpiece by Blueridge could easily cost twice as much under different circumstances. It is affirmed in quality by its detailed construction and tonal capabilities that leave nothing to be desired. The BR-43 delivers long-established sounds with a modern feel and looks, which after careful examination might leave you with an uncontrollable desire to get one for yourself. I’m not saying I have ten of these fiddles in my garage, but you get the point. The instrument’s 000-sized body is entirely comprised of high quality woods resulting in a sparkly resonant sound output demanding of awe and attention. The top is made of solid Sitka spruce, which is one of the most durable materials you can come across on today’s market. The guitar’s back and sides are made of mahogany, featuring a high gloss natural shade finish which makes the instrument aesthetically shine. The body is held together by a hand carved forward-X bracing pattern. The mahogany neck has a thin profile and it is dovetail joined to the body, hosting its rosewood fingerboard which comes equipped with an adjustable truss rod, 20 frets and pearl dot inlays with an impressive 1.68 inches wide bone nut. The instrument holds a total scale of 25.6 inches. This classical beauty’s hardware is comprised of six nickel-plated open back tuning machines with butterbean style buttons laying atop its headstock, as well as a rosewood bridge system sitting atop a bone saddle. The hardware allow for strikingly clear tones and superb string stability while delivering your melody the way you imagined it. This masterpiece packs an ample range of quality features fit together in a compact, comfortable and playable gitbox. The action is flawless, offering supreme accessibility all along the fingerboard while mostly nullifying fret buzz interference. The sound output can’t directly compete with that of a Martin 000 model, however it is still of excellent quality when you take its price point in consideration. The small body is a perfect match if you’re looking for a git that doesn’t take up too much space when playing or just resting in your room. Its lush, resonant tones will keep you satisfied for years to come, and its design will make you want to keep it forever. This fantastic inclusion in Blueridge’s Contemporary series is a perfect match for experienced maestros on a budget or beginners who are yet to take their first steps into the world of music. 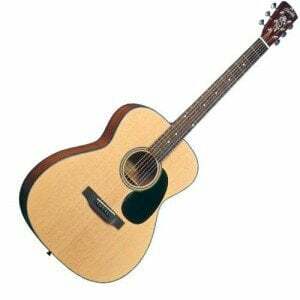 For more info about the Blueridge BR-43 Contemporary 000 Guitar, click here. Just bought one and loved it the moment I took it out of the wrapper Awesome soft/hard beautiful carry case with shoulder straps to boot. The sound is awesome. I had a Martin, but had to sell it to buy this one. The Martin had the 1 3/4″ wide neck and was harder to play. Played with friends last week and loved every minute of it. My friend had a Blueridge BR-160 and this sounded just as good, side by side with his. Love, Love, Love it!